day out with a fabulous Italian dinner. third time we have bought this same basket. our son’s house. Our plan was to use them as end tables when we moved to the area. My son and DIL fell in love with these baskets and their local store no longer carries them. I knew from our conversations it was going to be a battle to get them back. to find one more so they can keep the other two! large this thing is? Love it! he was looking at my catalogs, it was a total surprise that he would order this. the right was one of my luckiest Goodwill finds. Gotta run…on my way to another Hobby Lobby to look for another trunk. I absolutely LOVE that basket!! I was telling a client to get one~and she asked where!! I guessed maybe Pier one, but this is perfect! The basket is beautiful and so big. I bet you could fit a ton of blankets in there! I love the demi johns too – $2, really? You scored big time! Sherry, I don't blame your son and DIL for wanting the trunk baskets. I LOVE hamper/trunk style baskets, and what a great look under your table. Who would have thought Hobby Lobby? 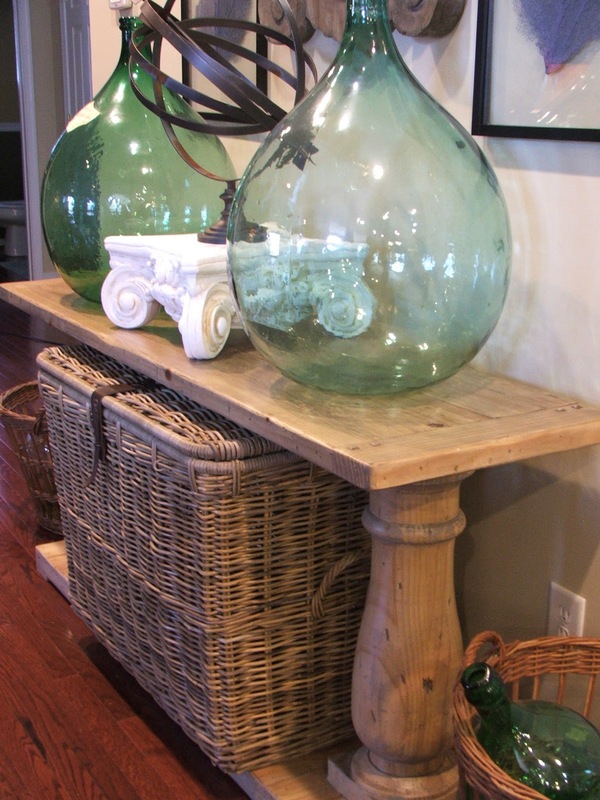 I can't believe your awesome find of the demijohn at GW, either. Wow, it's gorgeous. Gorgeous basket!! Love the whole little vignette. Great find! Oh, you and your $2 demijohn find make me sick. Just kidding. You lucky lucky thing. I love the basket from HL. I need to check out my store. I have not seen that there. Love that capitol. What a sweet hubby. I LOVE that grey trunk style basket! I remember seeing those at Hobby Lobby last year and really loved it. I just didn't have a place for it, or I would've bought it too. I still wish I had a place for it. I love how you put it under your console table like that. I can't believe you bought one of those giant demi-john bottles at GW for just $2! I don't think they had any idea what they truly had. I also don't understand how someone could just donate something that nice. I would've at least tried to sell it! Love the basket trunk. So great for storage and it looks great. I want one to. Oh, so fabulous…, the baskets, demi-johns…, they all feel coastal to me!! Love the capital, Sherry! Great piece you have on top of it, too. I'll bet that will be quite versatile in holding many different things. But what a great basket! How thoughtful of you you to let the kids keep the other baskets! I hope you find yours…and that you brought your 40% coupon! Oh I love that trunk Sherry!!! I need to find one too!! We just finally got a Hobby Lobby not too far from here in California- I wondered what you guys were talking about all this time!! Will have to stop in sometime and take a look for one of these! Fabulous basket, Sherry! Hope you find another! That basket is fabulous and I can't believe you found that armillary for only $5~ What a bargain! This is a fantastic basket…it can be used for so many things! I have a real love affair with baskets of all shapes and sizes! I ditto all the previous comments! I'll have to check our HL in Lexington nest time I'm there for that basket. Of course, the demi-john is an unbelievable find. Sherry, I love the way you shop! Love the basket and your fabulous frugal finds! Sherry wonderful basket it fits perfectly under your table! Super buys on the demi john! Great basket! I'm looking for something large to set under my game table. 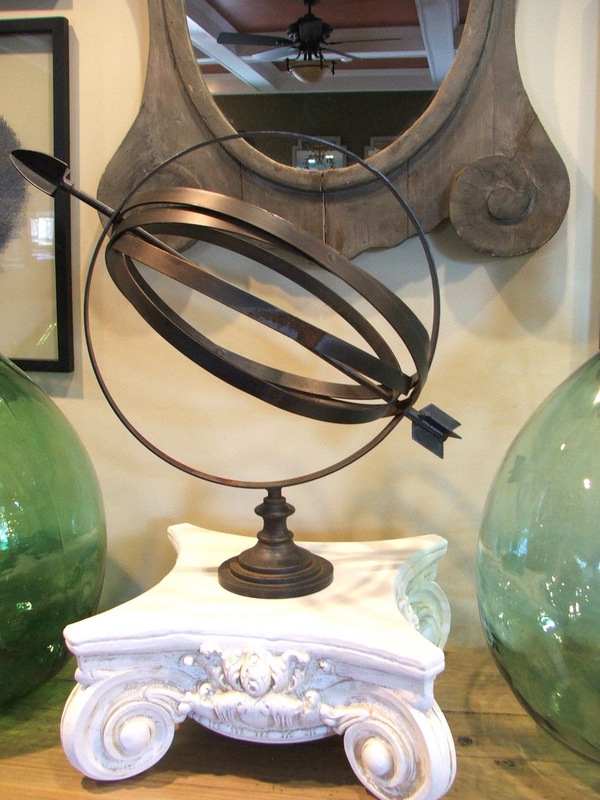 Your armillary on the capitol riser is great! I have a pair of them just a tad smaller and I'm always looking for ideas to use them! Great basket Sherry. I hope you find another one. Ok…..it looks like I'm going to have to make a Hob Lob run this week, Sherry! I LUV LUV LUV that huge basket! It's sooooo French!!! I can see it filled with white, chunky blankets spilling over the sides…..mmmmmm!!!! Yup. HL run for sure….. lol! Sherry you find the best stuff, and yes your husband is a keeper! Now I will be on the hunt to find my nearest Hobby Lobby, I've never been to one! Love the basket. Your whole arrangement is beautiful! 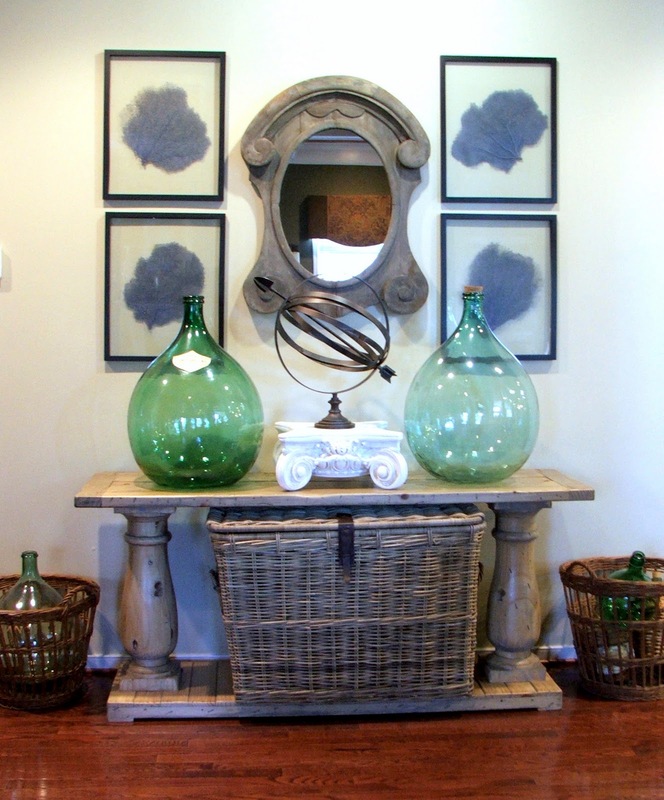 The large green bottles and your beautiful table… to die for! Love the trunk..especially where you placed it. There is great shopping in Florida!..If you ever get that way, try Reningers Antique market in Mt. Dora..wonderful place and their February antique fair is enormous..It takes you 3 days to go through it! What a great nook you've created there Sherry. It's lovely. The basket is a great find and I can't believe you scored that demi-john for so cheap!! I've been wanting to order that Ballard capital for the longest time. Probably will be discontinued by the time I get around to it! I love your wicker trunk. I bought one similar from Ikea and use it as a coffee table in front of a love seat. They are so practical and yours seems to have some detailing that mine lacks. Good luck on your search for one more. Sherry, I LOVE the basket! I have a thing for baskets 🙂 And those large bottles….gorgeous! Hope you find another trunk that matches, what a great idea to use them as end tables, that should look great. So nice of yur hubby to surprise you with that piece. That basket is huge – can't believe it's from Hobby Lobby!! Your son and MIL were right to "borrow" them! $2 for that demijohn – lucky you (you know I collect them too)! Sherry, this is just gorgeous! This willow trunk looks amazing! I love your demi johns too! Great treasures! Hope you find another basket. They should give you a discount for free advertising. I like your capital and armillary too. Great GW find.$2.00 is amazing. The demi john is gorgeous! What an amazing score. The basket is great as well, so versatile. Love having that texture in a room. Love the look – so Pottery Barn! I would be stressed if I knew I was going to be moving all that pretty stuff….I hate moving! But at least you're headed to a warm climate! hobby lobby? no! really? i have 3 of those and love them but didn't buy them there. i'm going to check it out. I'm crazy about baskets and yours is is awesome! 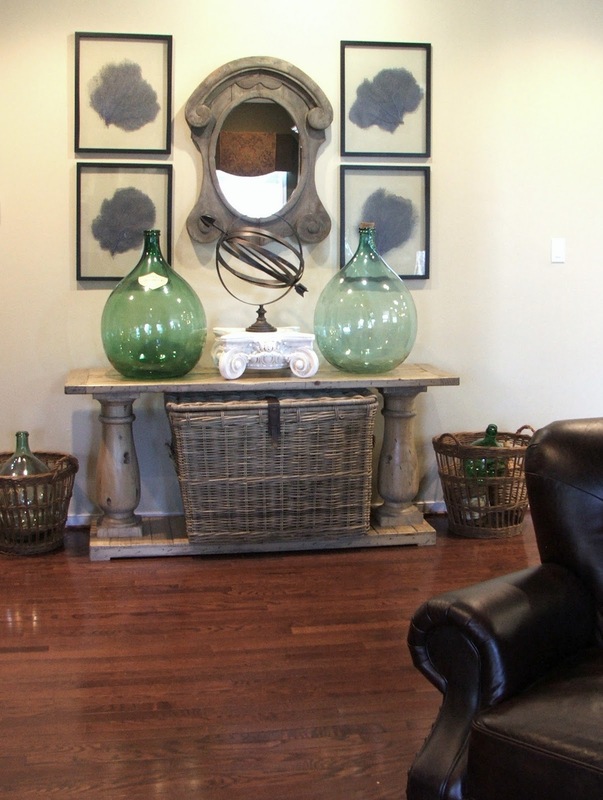 $2 demijohn…unreal! I'm off to look for baskets now! Have a great day! Hi……I have been a fan of Annie Sloan paint UNTIL…..I saw your blog post about the home-made versions! Well……I tried the unsanded grout but never could get it smooth enough to paint with:( Now I am looking for Calcium Carbonate….but NO LUCK! I tried the local GNC but they only have it in capsule form. The feed store has it in pellet form. Can't find a powder form:( Can you help? Where did you get yours and was it hard to get the paint smooth? Love the gray willow! I only wish we had a Hobby Lobby near here! Love your new basket. And those demi johns…I want one, too! Thanks for sharing. The basket is fabulous but the demijohns steal this post! Hello Sherry! Believe it or not I just found your blog and LOVE it!! Your home is gorgeous!! You found those trunks at Hobby Lobby? I am running to our store next weekend to look for one (do you want me to look for one for you too?!) And where did you find that mirror? I love it. I just noticed too that you have a link party, I will be sure to join. LOVE the giant basket! It is fabulous! I hope my Hobby Lobby carries them! The demi johns are gorgeous too! That basket is so awesome. I really love where you put it. If it's any consolation, I would have done the same thing to my mom if she found such wonderful baskets. I would love for you to share your fabulous post at our What's it Wednesday linky party. Thank you for sharing this lovely post and your terrific basket at Potpourri Friday! Oh me, I love that basket!! I just bought that one and the slightly smaller one and the gray wicker tray that goes with them. Glad for the tip!! !